∞OS is based on the original learning methodology, which can be applied in any educational context. You are not only learning the principles of ∞OS but also a new way to learn, which you can then use in a completely different realm. There are three approaches at the core of our methodology. 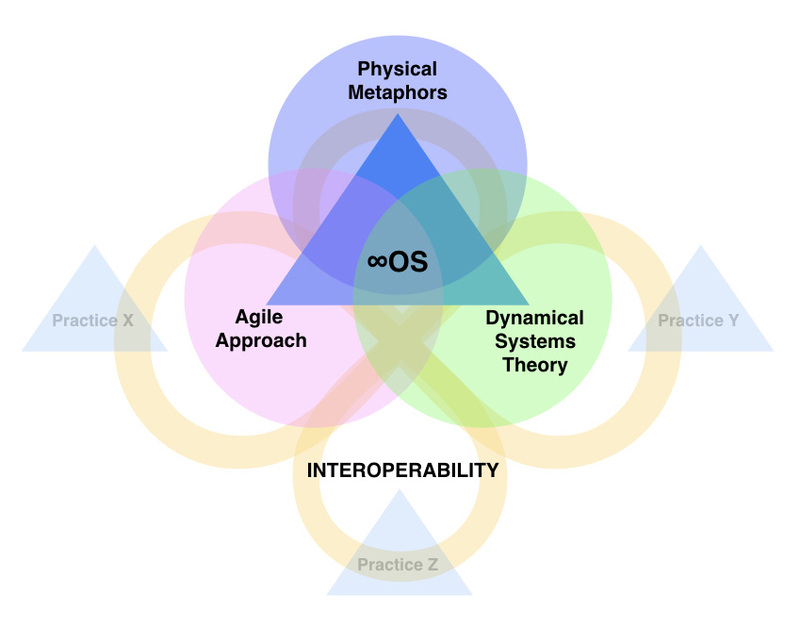 First, we use the metaphor of an open source operating system to emphasize the fact that what we propose is a framework, which is to be remixed, evolved, and applied for practical tasks. This makes it very different from other approaches, which claim to provide ultimate solutions and are often operating in a closed environment. 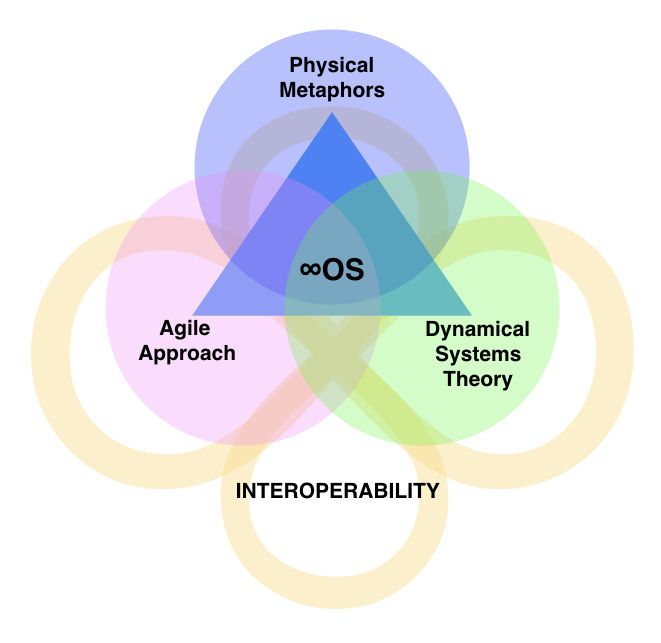 We like to think of ∞OS as the bodymind practice for the 21st century: open, interoperable, process-based, customizeable, constantly updated. This analogy also opens up our practice to a whole range of techniques, which are already used in computer programming: agile development, iterative approach, version control, compatibility with other systems (through an API), functional approach to programming your bodymind, etc. We also make heavy use of dynamical systems theory and network science to describe the processes we work with. These two frameworks are very useful in a way that they emphasize the dynamic relations and not static states. The mathematical tools behind those frameworks offer an advanced set of approaches, which may help resolve situations in a way that’s very efficient and precise. There are many examples of this paradigm shift in a wide range of fields: from network-centric warfare utilized by the US army and actor-network theory of Bruno Latour to the recent shift towards dynamic systems in cognitive science and sociology. Finally, we use physical metaphor and experience as the primary path to understand and implement new behavioral patterns. The reason is that we are all human and while we rely on intellectual understanding to learn new things, we only really get them when we experience them in real life. We could tell you that resisting a force that’s stronger than you would be a waste of energy and you would probably agree with us. But when it comes to the real life we often forget what we’ve learned intellectually and react with the old patterns, which were instilled into us by our education and culture. Therefore we add physical experience to intellectual learning: we invite you to physically experience what it’s like to resist a force that’s stronger with you, and — most importantly — what you could do about it with your own body, the different strategies you have to cope with it, assimilate it, and redirect it to your own advantage. Once you have this information stored in your body, you are much more likely deploy your new behavioral patterns should a similar situation arise in real life. 1) The first step is to find interesting patterns in what we do and in the world around us and to describe them from the perspective of dynamical systems theory and network science to better understand the relations that are in place. 2) The second step is to abstract and formalize their function (akin to functional programming approach). At this stage we use the computer programming analogies and various approaches that allow us to rapid-prototype the environmental parameters and the desired behavior. 3) The third step is to design a physical experiential metaphor that can transmit this function (e.g. ∞OS procedures). 5) The final step is deployment through practice. The best way to try our methodology is to join one of our regular trainings. If you prefer you can also inquire about one of our customized courses where we teach not only the principles of ∞OS but also our approach to constructing and deploying an operating system in a human environment.